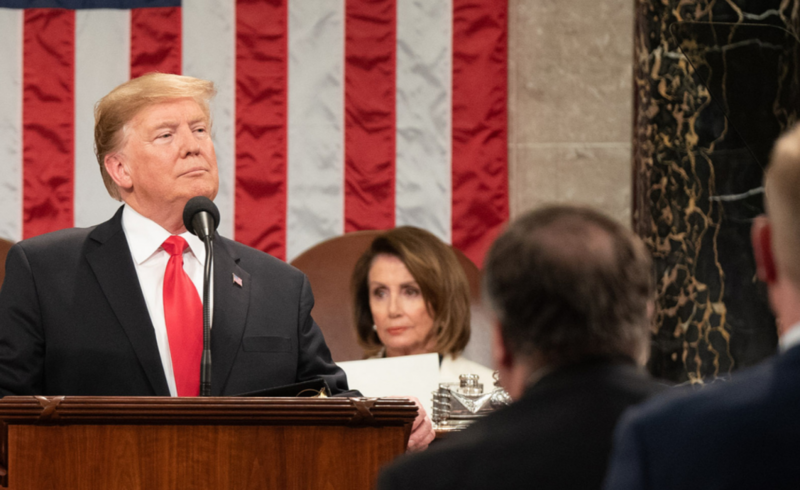 Speaking before Congress and the nation Tuesday evening, President Trump once again promised bipartisanship and instead delivered division. When it came to immigration, the president neither offered an olive branch nor acknowledged the devastating effects of his administration’s actions to date. Rather than offer solutions to the actual problems facing immigrants across the country, his speech reflected a fundamental misunderstanding of the state of immigration. Despite President Trump’s claims about border insecurity, the border is in fact safer and more secure than at any point in history. In the past two years, the number of people apprehended at the U.S-Mexico border has dropped to levels not seen since the 1970s. At the same time, the Border Patrol now estimates that it detects more than 90 percent of all attempts to cross the border. In addition, an increase in the arrival of families seeking asylum means that increasingly large numbers of asylum-seekers cross the border and then politely turn themselves in to the nearest Border Patrol officer. These families are not seeking to evade capture nor pose a threat to anyone; they are seeking access to the humanitarian protections that are at the foundation of American values. To the extent that there is a crisis at the border, it is one manufactured by the Trump administration. Rather than address the rising number of families by increasing capacity to process asylum seekers, the government has unveiled policy after policy seeking to stop people from coming in the first place. Some of those policies—like family separation or the ban on allowing asylum seekers to apply if they crossed between the ports of entry—have been halted by courts. Others, like the dangerous new policy forcing asylum seekers to remain in Mexico while they go through the court process, are just now going into effect . By focusing on deterrence instead of solutions, the administration has fueled a growing humanitarian disaster at the border. Trump continued to vilify individuals in the United States without status and painted compassion towards undocumented immigrants as a slight towards the native-born. But decades of research show that undocumented immigrants play a vital and important role in making this country great. Millions of undocumented immigrants pay taxes each year through the use of an Individual Tax Identification Number . In addition, undocumented immigrants pay over $10 billion each year into Social Security despite not being eligible to draw from those funds. Far from hurting American workers, there is little competition between the unemployment rate and the presence of recent immigrants of all types. Instead, the presence of both documented and undocumented immigrants helps build America’s economic growth. In 2018, Trump built much of his State of the Union speech around a call for his “ four pillars ” of immigration reform, one of which involved cutting legal immigration levels in half by eliminating family-based immigration. This year, Trump deviated from his prepared speech and stated that “I want people to come into our country in the largest numbers ever.” Unfortunately, over the past year his administration has worked harder than ever to cut legal immigration and make it more difficult to come to the United States. A recent analysis shows that processing delays at U.S. Citizenship and Immigration Services have reached “crisis levels,” slowing down the legal immigration process for everyone. The administration is also seeking to redefine the legal term “public charge” to block green cards for low-income immigrants, an action which could further slash legal immigration. Refugee admissions have also been cut to their lowest levels ever . When people come together to address the actual immigration issues facing this country, they can agree on common-sense solutions. Polls show that 81 percent of Americans agree that undocumented immigrants should be given a path to citizenship. From decreasing the use of detention to providing a permanent path to status for DREAMers and those with Temporary Protected Status, there are bipartisan solutions that exist if only the president would acknowledge them. If Congress wants to achieve true immigration reform, it must acknowledge the actual state of immigration and not the dark tale presented by the president. This post originally appeared on Immigration Impact. Reprinted with permission. Aaron Reichlin-Melnick is a Policy Analyst at the American Immigration Council, where he works primarily on immigration court issues and the intersection of immigration law and policy. He previously worked as a Staff Attorney at the Council, working on impact litigation, Freedom of Information Act litigations, and practice advisories. Prior to joining the Council, he was an Immigrant Justice Corps Fellow placed as a Staff Attorney at the Immigration Law Unit of The Legal Aid Society in New York City, representing immigrants placed in removal proceedings because of a prior criminal conviction. Aaron holds a J.D. from the Georgetown University Law Center and a B.A. in Politics and East Asian Studies from Brandeis University.